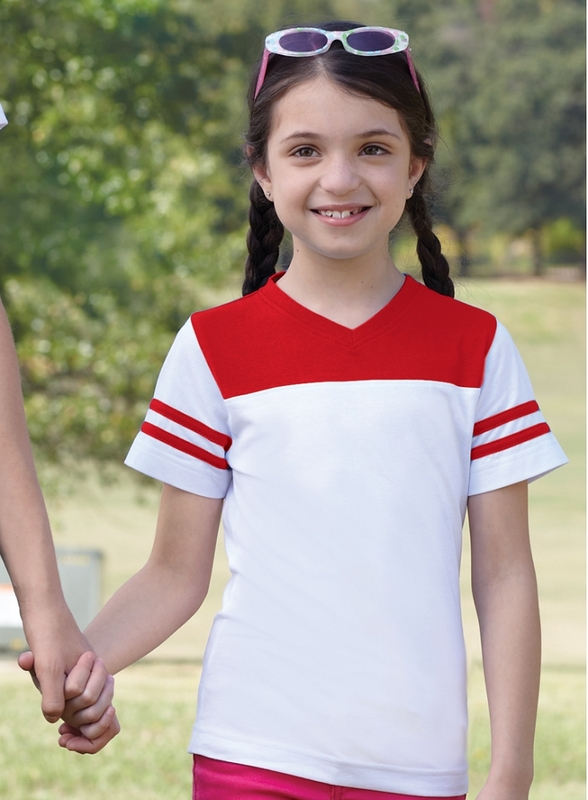 Get her ready for game day with these fashionable football t-shirts for girls. If you're into crafting, decorating or personalizing, you can easily add her name or favorite team to these blank football t-shirts. Also great layered or worn as plain girly football tees. Available in five classic athletic and girly fashion colors. 4.5 oz. 100% combed ringspun cotton jersey. Topstitch ribbed v-neck collar. Taped neck with EasyTearTM label. Contrast yoke front, back and stripes on sleeves. Double-needle hem sleeves and bottom. White is sewn with 100% cotton thread. Q: What is the sizing for this shirt, what is a Small equivalent to, i.e. 6?